"Kerosene Maxine" isn't going to like this. As the chairwoman of the House Financial Services Committee prepares to subpoena Deutsche Bank, which she described in a recent interview as "perhaps the biggest money laundering banks in the world", the New York Times on Saturday revealed that just as Trump was winning primaries in New Hampshire and South Carolina in March 2016, DB refused to expand a loan to the Trump Organization, which had been requested to pay for renovations at Turnberry, one of Trump's golf clubs in Scotland. The money was to be backed by Trump's golf club in Doral, Fla.
At the time, the bank already had hundreds of millions of dollars in loans oustanding to the Trump Organization, and Trump's go-to bankers in Deutsche's private banking unit were inclined to approve his request. However, senior executives at the bank - including now-CEO Christian Sewing - were skittish because of the "reputational risks" pertaining to Trump's divisive statements on the campaign trail. They also were uncomfortable with the political risks, fearing that if Trump won and then defaulted on the loan, Deutsche would be left in the awkward position of having to seize assets from the president of the US. According to the NYT, Trump asked for the money at a time when he was lending tens of millions of dollars to his campaign. But as the request wound its way to a committee of senior executives in Frankfurt, executives at the bank reportedly became aware for the first time just how much business DB had with the New York real estate developer who would soon become president. Since Trump's relationship with Deutsche first blossomed in the late 1990s, when the bank agreed to lend him $125 million to finance renovations on a Wall Street skyscraper, the relationship has endured its ups and downs. At the time, Deutsche was struggling to break into the US market and was more tolerant of risk than its US peers, who had more or less severed ties with Trump after a series of bankruptcies in the early 1990s. Though it was rocky at times (Trump sued DB during the apex of the financial crisis), his relationship with the bank continued through the dawn of his political career. The relationship between Mr. Trump and Deutsche Bank had survived some rocky moments. In 2008, amid the financial crisis, Mr. Trump stopped repaying a loan to finance the construction of a skyscraper in Chicago - and then sued the bank, accusing it of helping cause the crisis. After that lawsuit, Deutsche Bank’s investment-banking arm severed ties with Mr. Trump. But by 2010, he was back doing business with Deutsche Bank through its private-banking unit, which catered to some of the world’s wealthiest people. That unit arranged the Doral loans, and another in 2012 tied to the Chicago skyscraper. Mr. Trump’s go-to in the private bank was Rosemary Vrablic, a senior banker in its New York office. In 2013, she was the subject of a flattering profile in The Mortgage Observer, a real estate magazine owned by Mr. Trump’s son-in-law, Jared Kushner, who was also among her clients. In 2015, she arranged the loan that financed Mr. Trump’s transformation of Washington’s Old Post Office Building into the Trump International Hotel, a few blocks down Pennsylvania Avenue from the White House. In a statement to the Wall Street Journal, a rep from the Trump organization denied that it had sought money for Turnberry in 2016, and denounced the NYT story as "absolutely false." "This story is absolutely false. We bought Trump Turnberry without any financing and put tens of millions of dollars of our own money into the renovation which began in 2014. At no time was any money needed to finance the purchase or the refurbishment of Trump Turnberry," she said. In a separate but similar story, the Wall Street Journal reported on Saturday that Deutsche Bank rushed to offload a $600 million loan to Russian state-controlled banking giant VTB in late 2016 as the German lender sought to limit its exposure to Russia following the infamous mirror trading scandal. The bank decided to shed the loan amid worries about its financial relationships with Russian entities. And though WSJ couldn't figure out how VTB used the money that DB lent it, a Deutsche spokesman insisted that the money wasn't intended to benefit President Trump or his businesses as part of some back-door deal. The Wall Street Journal couldn’t determine where the loan money went. Deutsche Bank considered the VTB financing standard bank-to-bank funding, provided to VTB in U.S. dollars, according to the people familiar with the funding. VTB said in a statement to the Journal that the loan "was intended for the purposes of VTB’s treasury business activities," and wasn’t directed to President Trump or any business affiliated with him. A spokesman for Deutsche Bank said, "Any assertion that our financing to VTB was intended to benefit President Trump or anyone else connected to him is false." The scrutiny of VTB is tied to an email exchange between Michael Cohen and former Trump associate Felix Sater, who promised Cohen that the Russian bank would be willing to finance the infamous Trump Tower Moscow project. Cohen had also reportedly planned to meet with senior VTB executives during a trip to Moscow back in May 2016, but the trip didn't pan out. 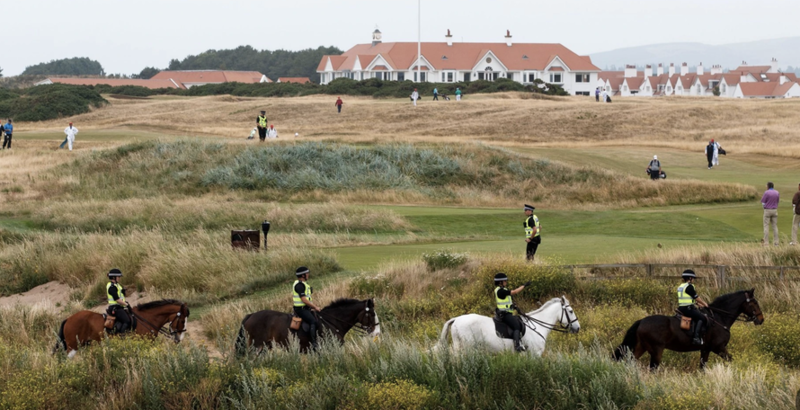 One prominent golf journalist, cited in the NYT story about Deutsche refusing a loan to the Trump Organization during the campaign, claimed that Eric Trump once told him back in 2013 that the Trump Org used money it had received from Russian sources to finance the purchases and renovations of about a dozen golf clubs and resorts around the world. The Trump Org has insisted that it relied on its own money to finance these projects. VTB was among a handful of Russian lenders who were hit with US sanctions after the annexation of Crimea in 2014, making the Deutsche Bank's loan even more valuable to the bank - and even more difficult for Deutsche to sell. Still, if nothing else, the deal shows how closely interlinked Deutsche and VTB had become. But so far, at least, nobody has uncovered any evidence linking the Trump Organization to VTB. But it looks like "Kerosine Maxine" is hoping to change that.